In this fragrant, one-pot vegetarian dish from Michoacán - whose elegant capital, Morelia, has one of the liveliest markets in all Mexico - the earthiness of the beans is softened by the nutty sweetness of the corn, while the pumpkin melts to thicken the broth. In Mexico, pinto beans would be used; here, we've used borlotti, a close Italian equivalent. The combination of the three vegetables mirrors the growing pattern in the fields: maize stalks give support for the bean vines, while pumpkin is an effective weed inhibitor between the rows. If using dried beans, drain them and transfer to a roomy pan. Add enough water to cover them by about 2cm. Bring to the boil and skim off any scum. Turn down to a simmer, cover and cook for 1-1½ hours, until the beans are perfectly tender but still keep their shape. Very old beans may take even longer. Top up the pan with boiling water as necessary, but don't add salt. When the beans are tender, add the pumpkin or squash. If using tinned beans, drain and rinse them. Put in a large pan with the squash and 250ml water. Bring the beans and squash to the boil, then simmer until the pumpkin is soft; about 15 minutes. Stir in the sweetcorn. Simmer for another 15 minutes. Mash lightly to thicken the broth. To make the salsa, drop all the ingredients into a blender and process until smooth. Stir half the salsa into the cooked beans and squash. Fry the tortilla strips briefly in the oil until crisp. Drain on kitchen paper. 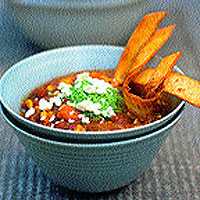 Ladle the cocido into bowls and top each with a handful of tortilla strips, a spoonful of salsa and a crumbling of cheese. Serve with the pickled chillies. The sweet earthiness of this dish requires a slightly vegetal, Sauvignon Blanc-based white.